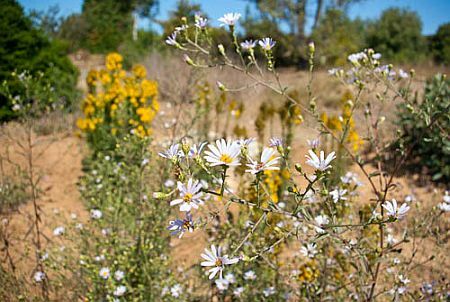 Adjacent to the California Entrance Garden and to the left of the path leading to the New Zealand area, you'll discover the formation and planting of the Butterfly Garden based on California native plants, small and modest at the moment, but holding promise of greater things to come. 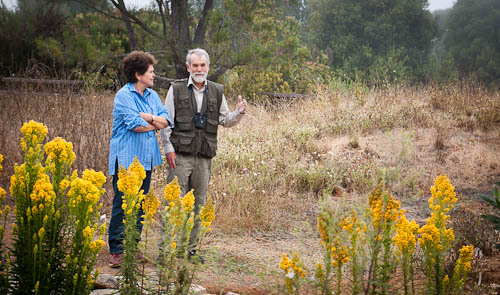 Clive Bagshaw, in vest, a visiting professor at UCSC from England, volunteered for this project after the Volunteer Orientation class in 2011, and he and fellow volunteer Maryellen Crummer are now working hard to create an inviting environment for the numerous species of butterflies which inhabit the Arboretum & Botanic Garden. 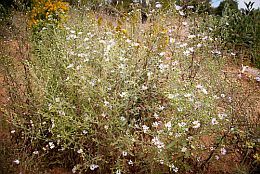 Manager Brett Hall provided equipment, rocks, and assistance in reconfiguring the terrain; Linda Willis, our butterfly expert, advised as to which flowers and shrubs would be attractive to the butterfly population and provided plants from her own California Natives collection; Helen Englesberg, curator of the Growing Area, was responsible for propagating and providing the other plants. 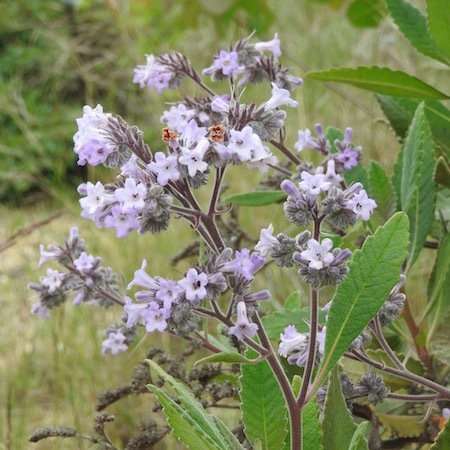 This perennial herb is a grayish green, aromatic plant which forms large mats about 1 foot high, topped by dense flower heads ranging in color from near white to blue-purple. 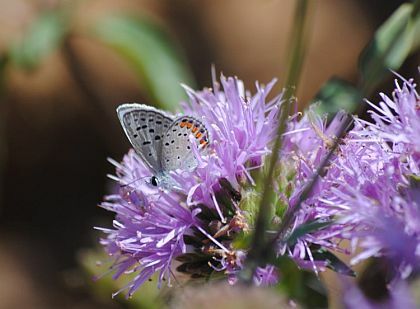 Right, an Acmon Blue butterfly (Plebejus acmon) feeds on Monardella odoratissima. 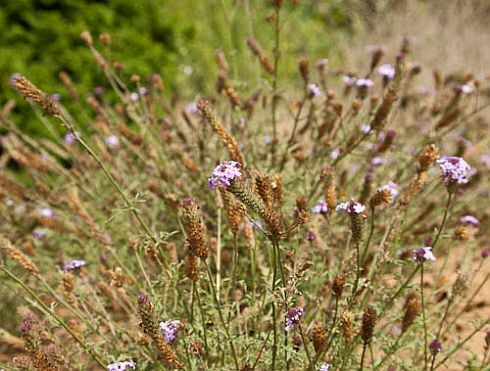 Verbena lilacea has a handsome, mounding habit with blossoms in varying shades of purple, and is very attractive to butterflies. 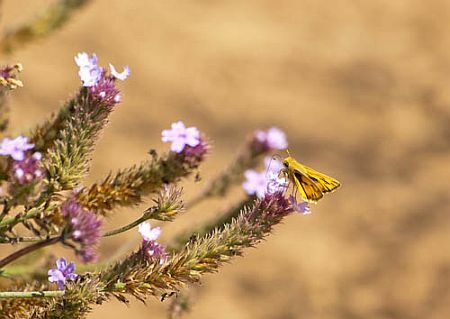 Below and right, a Fiery Skipper butterfly (Hylephila phyleus) visiting verbena. 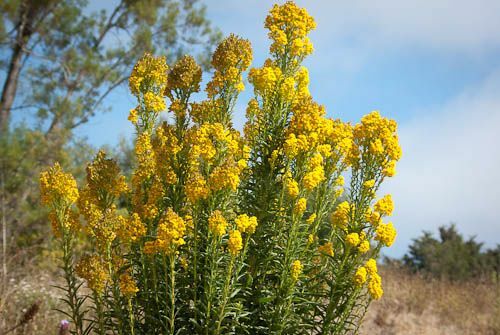 Golden Rod is a tall, bright yellow herbaceous perennial found in meadows and pastures, along ditches and waste areas. 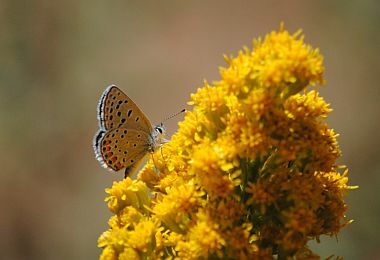 It is a host to many insect species, including butterflies. 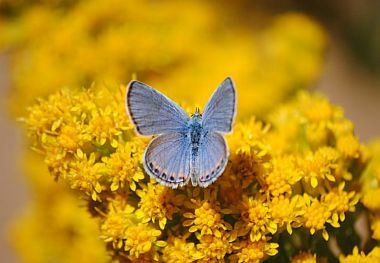 Above and below, an Acmon Blue butterfly (Plebejus acmon) feeds on Solidago confinis. 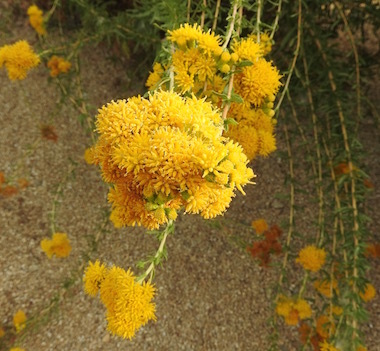 Another recent edition has been the Isocoma-menziesii (Golden Bush). 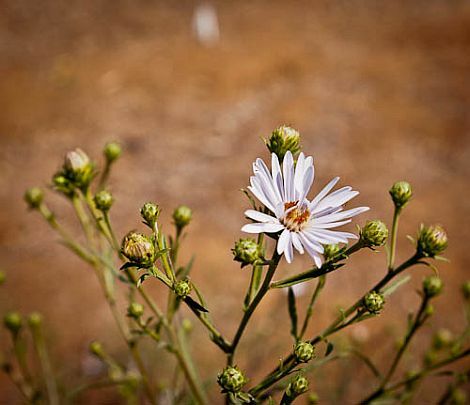 The name aster derives from the Greek word for “star”, a reference to the shape of the flower head. 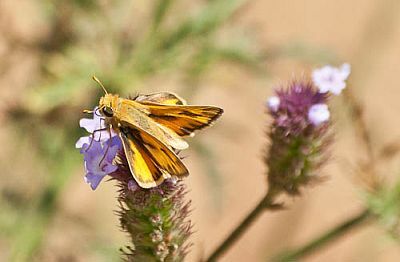 Asters are used as a food plant by the larvae of several lepidoptera species, including the hummingbird hawk moth. 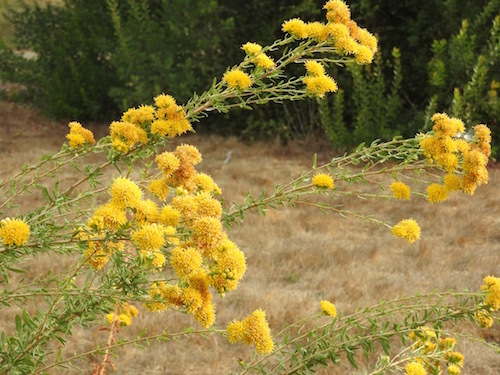 What a coup if one were to find its way to the Garden! 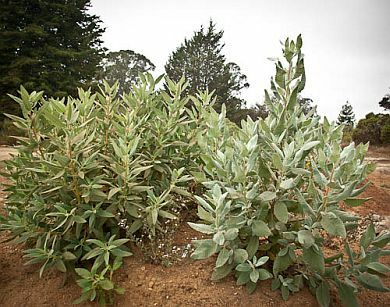 A native of the waterleaf family, this shrub can grow to a height of 5 or 6 feet. 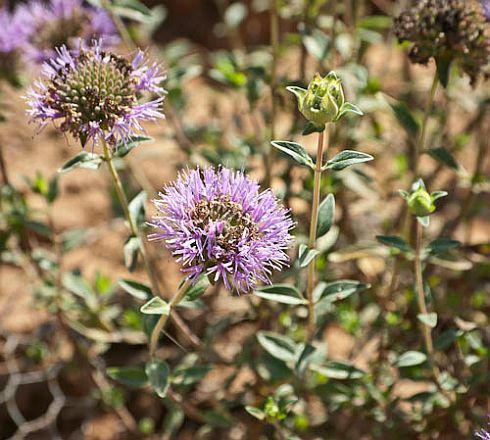 It has blue flowers, and its evergreen felted leaves were used by Native Americans as a medicinal tea to soothe a sore throat.